Baby Hazel kite flying is a fun and exciting online game in which Baby Hazel is preparing to take part in a kite festival. To win this game you must complete three levels. The first level is to learn how to fly a kite. The second level is to make a kite. The third level is to go out and play with her friends and enjoy sharing the kite with them. The first level takes Baby Hazel through obstacles to learn how to fly her kite. She first asks her pet bunny,Honey Bunny for help, but fails. So she asks her friend the bird, Budgie to help her but her kite still wont fly. Finally her dad teaches her the proper way to fly a kite. But oops, Bunny got the kite stuck in a tree. So now Hazel must make a new kite. 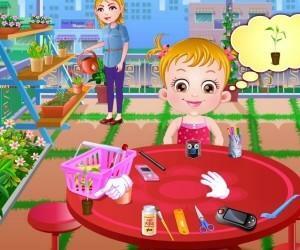 The second level takes Baby Hazel through an exciting journey of creating her own kite by herself. She adds stickers, monkey pictures and finally the string for the perfect kite. She even has a special gift to give to her pet cat, Katy and Bunny. While making her kite Hazel’s friends call and invite her to the park. Hazel changes clothes and gets ready to show off her new kite to her friends. The third level shows how sharing can make a fun day, exciting. Baby Hazel gets to the park and notices that one of her friends are very sad. She discovers that her friend’s kite was torn, so Hazel decided to share her kite with her friend. After playing for a while the friends decide to have a kite race to win a candy gift box. 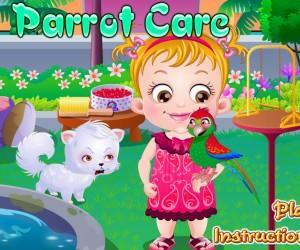 This game is very easy to play and even preschool children can play it very easily. You just have to use the mouse to drag objects and people around and provide Hazel, her pets, her dad and her friends with all the things they need. Each level has a happiness bar and the goal of the game is to ensure that Hazel’s happiness bar is filled 100%. The game also has a score at the top. You earn more points whenever you complete a task in a timely maner. Baby Hazel can’t wait to participate the flying Kites festival together with her dad and friends. Her dad is teaching her how to fly a kite when her kite gets hooked into a tree, because of the notorious Bunny’s blunder. She is left in despair but her dad motivates her to not give up and make a new kite for the festival. Help our little darling princess make a new kite and get ready to leave the ground! She joins her friends that are already there flying kites. 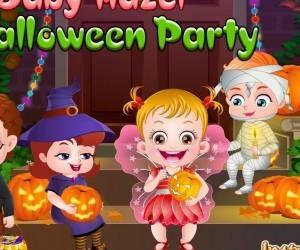 Enjoy this amazing activity with Baby Hazel and her friends.